There is a safety feature on iPhone that allows you to silence notifications and divert all incoming calls to voice mail, while you are driving. 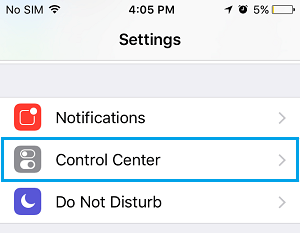 You will find below the steps to enable Do Not Disturb While Driving Mode on iPhone. Answering Calls and Texting while driving can be deadly. While most people are aware of this danger, very few can resist the temptation to answer calls or to take check incoming messages on their iPhone. Hence, it is recommended that enable Do Not Disturb While Driving Mode on iPhone, in order to avoid all distractions and keep your focus on the road while driving. 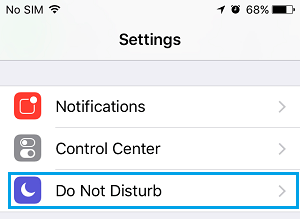 Once your iPhone is placed in Do Not Disturb While Driving Mode, all Notifications and Alerts will be automatically disabled on your iPhone and all Incoming Calls will be diverted to the Voicemail. Follow the steps below to enable Do Not Disturb While Driving Mode on your iPhone. 1. Open Settings > tap on Do Not Disturb. 2. On the next screen, scroll down and tap on Activate option located under “Do Not Disturb While Driving” section. 3. On the Activate screen, you can choose from Manually or When Connected to Car Bluetooth options. When Connected to Car Bluetooth: You can choose this setting, in case the stereo on your Car has Bluetooth. Choosing this option will enable Do Not Disturb Mode on iPhone as soon as it gets tethered to the Bluetooth in your Car. Manually: You will need to Manually enable Do Not Disturb While Driving on iPhone by pulling your finger Up on the screen of your iPhone and tapping on the Car Icon. Follow the steps below to configure Auto-Reply settings on your iPhone, whenever it is placed in Do Not Disturb While Driving Mode. 2. On the Do Not Disturb screen, scroll down and tap on Auto-Reply. In case you want to, you can customize this message to suit your requirements by tapping on the Message and typing your own Message. 3. Now, go back to “Do Not Disturb” screen and this time tap on Auto Reply To option. Adding Do Not Disturb While driving to the Control Center on iPhone makes it easy to Manually Enable or Disable Do Not Disturb While Driving Mode on your iPhone. 1. Tap on Settings > Control Center. 2. On the Control Center screen, tap on Customize Controls option (See image below). 3. On the next screen, scroll down and Tap on the green + sign next to Do Not Disturb While Driving option (See image below). This will Add “Do Not Disturb While Driving” option to the Control Center on your iPhone, making it easy to Enable or Disable “Do Not Disturb While Driving Mode” at any time on your iPhone. 1. Swipe up from the bottom on the screen of your iPhone. This will bring up the “Control Center” on your iPhone. 2. On the Control Center screen, simply tap on the Car icon and this will Enable Do Not Disturb While Driving Mode on your iPhone. Follow the steps below to Disable Do Not Disturb While Driving Mode on iPhone. 1. Swipe up from bottom on the screen of your iPhone. 2. On the Control Center screen, tap on the lighted Car icon. This will immediately disable Do Not Disturb While Driving Mode on your iPhone.